The flavours in this dish are absolutely fantastic and the combination of the potato and the sweet potato makes for a really interesting option. Stir together all ingredients for the marinade and pour over the pork chops. Leave them to marinade for up to three hours. After this time remove the pork chops from the marinade, but retain the marinade. Heat a large pan with a little oil and cook the chops of both sides for 3-4 minutes until they have browned off and then pour in the remaining marinade and allow this to come to the boil. Pop the pan into a preheated oven for 10-15 minutes to continue cooking. Peel the potatoes and put them into a large saucepan and cover with water. Bring to the boil and boil until tender. Strain off the water and leave to steam in the saucepan for 5-6 minutes to continue to soften. Mash with the butter and milk until smooth and then add in the chopped scallions and mix well. 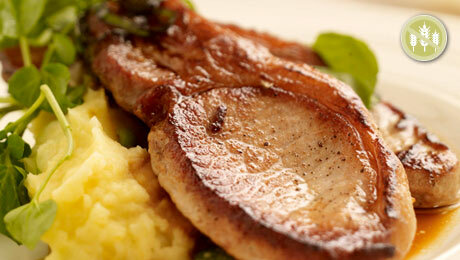 To Serve, season lightly and serve with the soy and honey glazed pork chops. Saw the video looks tasty and simple to prepare - pity there is no click and order the ingredients facility.